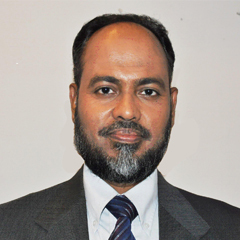 Dr. Abdulazeez Abdulraheem is an Associate Professor focusing mainly on geomechanics and the applications of artificial intelligence in different areas of petroleum engineering. Before joining the department, he has worked as a Research Engineer in the Research Institute at KFUPM for almost 18 years addressing field challenges in areas such as wellbore instability, sand production, and experimental rock mechanics. Ph.D. in Geotechnical Engineering, GPA 4.0/4.0, University of Oklahoma, Norman, OK, USA. – 1994. M.E., in Civil Engineering, Indian Institute of Science, Bangalore, India. – 1985. B.E., in Civil Engineering, Osmania University, Hyderabad, India. – 1983. Abdulraheem, A., M. Zaman, and J.-C. Roegiers (1993). A Finite Element Model for Ekofisk Field Subsidence, Journal of Petroleum Science and Engineering, Vol. 19, pp. 299-310. Zaman, M., J.-C. Roegiers, A. Abdulraheem, and M. Azeemuddin (1994). Pore collapse in Weakly cemented and porous Rocks, ASME Journal of Energy Resources Technology, June, Vol. 116, pp. 97-103. Hassan, H.M., Korvin, G., and A. Abdulraheem (2001). Fractal and Genetic Aspects of Khuff Reservoir Stylolites, Eastern Saudi Arabia. Arabian Journal of Science and Engineering Journal. 27(2001): 29-56. Korvin, G., Mohiuddin, M.A., A. Abdulraheem (2001). Experimental Investigation of the Fractal Dimension of the Pore Surface of Sedimentary Rocks under Pressure. Geophysical Transactions, 44 (2001): 3-19. Mohiuddin, M.A., K. Khan, A. Abdulraheem, A. Al-Majed, and M.R. Awal (2007). Analysis of wellbore instability in vertical, directional, and horizontal wells using field data. Journal of Petroleum Science and Engineering. 55 (2007). pp. 83-92. M.A. Al-Marhoun, S. Nizamuddin, A.A. Abdul Raheem, S. Shujath Ali, A.A. Muhammadain. (2012). Prediction of crude oil viscosity curve using artificial intelligence techniques. Journal of Petroleum Science and Engineering 86-87 (2012) 111–117. Anifowose F., J. Labadin, A. Abdulraheem, Ensemble Learning Model for Petroleum Reservoir Characterization: A Case of Feed-Forward Back-Propagation Neural Networks, In: Trends and Applications in Knowledge Discovery and Data Mining, Lecture Notes in Computer Science Volume 7867, 2013, pp 71-82. G. Korvin, Oleschko, K., and A. Abdulraheem (2013). A simple geometric model of sedimentary rock to connect transfer and acoustic properties. Arabian Journal of Geosciences. February 2013. Ali, S.S., S. Nizamuddin, A. Abdulraheem, M. R. Hassan, M. E. Hossain. (2013). Hydraulic unit prediction using support vector machine. Journal of Petroleum Science and Engineering. 110 (2013) pp 243–252. F. Anifowose, J. Labadin, and A. Abdulazeez. (2013). “A Least Square-driven Functional Networks Type-2 Fuzzy Logic Hybrid Model for Efficient Petroleum Reservoir Properties Prediction”, Neural Computing and Applications, DOI 10.1007/s00521-012-1298-2, 2013. Ali, S.S., S. Nizamuddin, A. Abdulraheem, M. R. Hassan, M. E. Hossain. (2013). Hydraulic unit prediction using support vector machine, Journal of Petroleum Science and Engineering Volume 110, Pages 243-252. Al-Marhoun, M. A., S. S. Ali, A. Abdulraheem, S. Nizamuddin, A. Muhammadain (2014) Prediction of bubble point pressure from composition of black oils using artificial neural network, Petroleum Science and Technology, 32:14, 1720-1728. F. Anifowose, S. Adeniye and A. Abdulraheem (2014), “Recent advances in the application of computational intelligence techniques in oil and gas reservoir characterization: a comparative study”, Journal of Experimental & Theoretical Artificial Intelligence, 2014. doi = 10.1080/0952813X.2014.924577. Anifowose, F., J. Labadin, A. Abdulraheem (2015). Ensemble Model of Non-linear Feature Selection-Based Extreme Learning Machine for Improved Natural Gas Reservoir Characterization. Journal of Natural Gas Science & Engineering. doi:10.1016/j.jngse.2015.02.012. Abdlmutalib, A, O. Abdullatif, G. Korvin, and Abdulraheem. (2015). The relationship between lithological and geomechanical properties of tight carbonate rocks from Upper Jubaila and Arab-D Member outcrop analog, Central Saudi Arabia. Arabian Journal of Geosciences. May 2015. DOI 10.1007/s12517-015-1957-6. Adebayo, A. R., A. Abdulraheem, S.O. Olatunji. (2015). Artificial Intelligence Based. A. Al-Ameri, A. Abdulraheem, M. Mahmoud. Long-Term Effects of CO2 Sequestration on Rock Mechanical Properties. Journal of Energy Resources Technology. J. Energy Resour. Technol 138(1), 012201 (Dec 01, 2015). Paper No: JERT-15-1186; doi: 10.1115/1.4032011. Anifowose, F.A., J. Labadin, A. Abdulraheem (2016). Hybrid intelligent systems in petroleum reservoir characterization and modeling: the journey so far and the challenges ahead. Journal of Petroleum Exploration and Production Technology. doi:10.1007/s13202-016-0257-3. Jun. 2016. Anifowose, F. S. Adeniye, A. Abdulraheem, A. Al-Shuhail (2016). Integrating seismic and log data for improved petroleum reservoir properties estimation using non-linear feature-selection based hybrid computational intelligence models. Journal of Petroleum Science and Engineering 145. Sep. 2016. pp 230–237. Elkatatny, S., M. Mahmoud, I. Mohamed, A. Abdulraheem (2017). Development of a new correlation to determine the static Young’s modulus. Journal of Petroleum Exploration and Production Technology. doi:10.1007/s13202-017-0316-4. Elkatatny, S., Mahmoud, M., Z. Tariq, A. Abdulraheem. (2017) New insights into the prediction of heterogeneous carbonate reservoir permeability from well logs using artificial intelligence network. Neural Computing & Applications (2017). doi:10.1007/s00521-017-2850-x. Elkatatny, S.M., Mahmoud, M.A., Moahmed, I., and Abdulraheem, A. 2017. Development of A New Correlation to Determine the Static Young’s Modulus”, Journal of Petroleum Exploration and Production Technology, In Press. 2003 – Project Manager of the team awarded for Best Research Team Award of the Research Institute, KFUPM for the project, “Wellbore Instability – Khafji Reservoir (Phase II)”. 2002 – Best Research Project Manager Award of the Research Institute, KFUPM for the project, “Wellbore Instability – Khafji Reservoir (Phase I)”. 1999 – Project Manager of the team awarded for Best Research Team Award of the Research Institute, KFUPM for the project, “Rock Mechanics Study of Ghawar Khuff Reservoirs” (PN 21148). 1999 – Member of the team for Best Short Course Award by KFUPM. 1993 – Best paper award by “Indian Geotechnical Journal”.